All downloadable maps are free on PC, included in the various patches. Lacks two-player splitscreen present on console versions. Requires PunkBuster update to play on protected servers which is no longer hosted on Even Balance's website. Steam DRM v2. See below for a workaround. Available for free. Included with Patch v1.2. See Patches for a download link. Available for free. Included with Patch v1.4. See Patches for a download link. Available for free. Included with Patch v1.5. See Patches for a download link. Available for free. Included with Patch v1.6. See Patches for a download link. Only needed for retail version. All patches must be installed in order. Change seta com_startupIntroPlayed "0" to seta com_startupIntroPlayed "1". See the WSGF entry or use Widescreen Fixer. In-game AA must be disabled. Force AA externally if required. Type /r_fullscreen 0;vid_restart into console. Frame rate is capped at 85 FPS by default. Use com_maxfps 0 in the console to remove the cap. Go to Options, Player name indicator; changes to blue and orange. FOV is capped at 80 on the majority of multiplayer servers. Set cg_fov to preferred FOV value. The tool has to be running during gameplay. Works in online co-op games. To change fov in multiplayer open CoDWaWmp.exe with a hex editor such as HxD. Go to address 004A3240 and change 82 42 to A0 42 for fov 80 or B4 42 for 90. To do the same in singpleplayer open CoDWaW.exe with a hex editor such as HxD. Go to address 004AEF40 and change 82 42 to A0 42 for fov 80 or B4 42 for 90. Bring up the console and type devmap followed by the map you want to load (map names list). Has to be repeated for every map load. Does not work in co-op modes. Type exec default_controller in the console. Requires Patch 1.6. Controller doesn't work in menus. Type input_viewSensitivity in the console, with a value between 0.1 and 5. Type input_invertpitch 1 in the console. While there are technically no button prompts, binding actions on a controller shows a colored letter instead of a proper prompt. This shows up in gameplay. 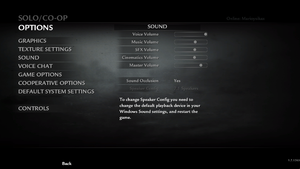 Subtitles are shown only for main dialog. Foreign languages are ignored. Select Sound, Video, Game Controllers. Disable Unimodem Half-Duplex Audio device. Set compatibility mode to Windows XP SP2. PunkBuster has dropped support for the game; by default, every new install has this issue. Extract the contents of the download to <path-to-game>. Overwrite all when asked. Create a folder and name it whatever you want. Create active.txt file (still in profile folder) and inside write name of that new folder you made. Appears to be caused by enabling 4x Anti-aliasing. 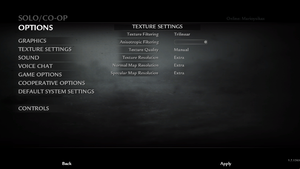 In Graphics Settings, limit Anti-aliasing to 2x, or alternatively force 4x or higher externally. Game gives impression of stuttering despite a locked frame rate. 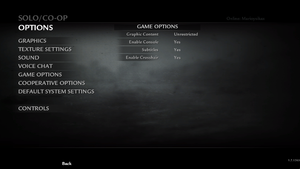 In Graphics Settings, enable Dual Video Cards. The game has some compatibility issues with older operating systems such as Windows 7 due to the outdated graphics stack (WDDM). Back up your files and programs. Go to Microsoft site . Select at will the type of transition to Windows 10. Upgrade to Windows 10 or reinstall from scratch. Download and install the latest drivers for your configuration, in particular the video card. Turn off the transparency of the desktop interface in the system settings in the personalization color section. 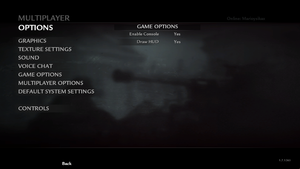 You can also turn on the game mode in the system settings to ensure a higher priority of the game in automatic mode. This action is the cornerstone of stability and smoothness of the gameplay, as Windows 10 has more advanced basic elements that the game requires. You can also disable the function of HPET which is a technology of high-precision timer in the motherboard. This can sometimes cause performance problems. Tap on the Windows-key, enter cmd, right-click cmd.exe in the results listing and select to run the command prompt with administrative privileges. Search "Device Manager" on your PC. Scroll down to "System Devices" and open the sub-menu. Scroll to "High Precision Event Timer" and click it. Click "Actions" at the top of the window, and from that pop-up menu, click "Disable". Navigate to configuration file location and open configuration file. Change seta r_mode into the desired resolution and save. Repeat for second configuration file (single player and multiplayer). Retail version requires a LanFixed EXE. Allows unlocked FOV in co-op. Increased memory and asset limits. Provides a native borderless windowed mode. Place the files there from the RAR archive. Change seta r_gamma "1" to seta r_gamma "0". Change seta r_ignorehwgamma "0" to seta r_ignorehwgamma "1". ↑ 2.0 2.1 File/folder structure within this directory reflects the path(s) listed for Windows and/or Steam game data (use Wine regedit to access Windows registry paths). Games with Steam Cloud support may store data in ~/.steam/steam/userdata/<user-id>/10090/ in addition to or instead of this directory. The app ID (10090) may differ in some cases. Treat backslashes as forward slashes. See the glossary page for details. 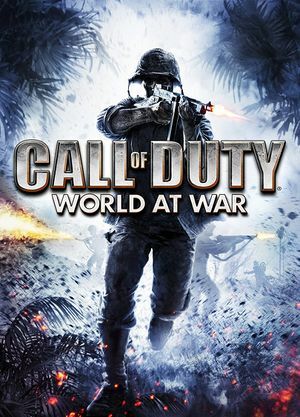 ↑ Steam guides: CoD: WaW Commands. - Campaign Map Commands. ↑ Polite And Friendly - Working Punkbuster files for new COD: World at War installs. This page was last edited on 17 April 2019, at 22:50.